The human nervous systemconsists of four parts: the brain, spinal cord, autonomic nervous system, and peripheral nerves. Peripheral nerves are cord-like structures containing bundles of nerve fibers that carry information from regions of the body to the spinal cord (and vice versa). Constructed in a fashion similar to telephone cables, peripheral nerves have a tough outer layer of connective tissue that surrounds discrete groups of miniscule fibers, called “axons,” each originating from its own nerve cell. The primary function of a peripheral nerve is to transmit signals from the spinal cord to the rest of the body, or to transmit sensory information from the rest of the body to the spinal cord. For example, to flex a muscle, the brain sends a signal to the spinal cord that is received by a motor neuron in the spinal cord. This neuron sends the signal down an axon, which may be up to 3 feet long. This axon terminates in a muscle, where the impulse to flex is received. Once the muscle receives this signal, it flexes. The whole process requires only a fraction of a second to occur. Some nerves in the body, such as the sciatic nerve, are quite large and can be over 1 centimeter in diameter. Other peripheral nerves are so small that they cannot be readily seen without magnification. The central nervous system includes the brain and spinal cord. Injuries in these locations have only a very limited capacity to heal, because nerve regeneration tends not to occur. In contrast, peripheral nerves have a striking capacity for regeneration. Even completely severed peripheral nerves, if repaired in a timely fashion, can regrow, allowing the patients to enjoy complete, or nearly complete recovery in many cases. When a peripheral nerve is cut, the axon segments distal to the injury (furthest away from the spinal cord) die off in a process called “Wallerian degeneration.” When the nerve is repaired, the axons in the proximal segment (closest to the spinal cord) regrow into the distal, denervated segment. This growth occurs at a rate of about 1 mm per day. This translates roughly to 1 inch per month, or 1 foot per year. Once the axons regrow back into the denervated muscles, the muscles will begin to function again. During the time it takes for the axons to regrow into the muscles, a process that can take many months, or even years, the muscles will be paralyzed and will atrophy. This is an important point when dealing with peripheral nerve injuries. The healing process almost invariably requires an extensive amount of time to occur. It is important for patients not to lose hope during this time. It is vital that they participate in their exercises, keeping the affected muscles and joints flexible and ready to be used once again when the axons regrow into them. It is not unusual for patients to undergo a lengthy, complex, peripheral nerve reconstruction procedure, only to see no evidence of recovery for a year or more. This can be immensely frustrating for the patient. Unfortunately, there is nothing in medical science currently that can make these axons grow any faster. Perhaps it is best to think of this delay all as part of the healing process, paving the road to getting better! How are peripheral nerve problems diagnosed? The most important diagnostic study in the evaluation of peripheral nerve problems is electromyography (EMG) with nerve conduction studies (NCS). This study provides accurate, quantitative information on the function of nerves and muscles and helps to more precisely localize the region of injury, and to pick up more subtle signs of injury and/or recovery that are otherwise undetectable to the examiner.. Sometimes it is the only way to reliably localize a lesion, quite crucial if surgery is being contemplated. Unfortunately, this study can make some patients uncomfortable, as it involves placement of tiny needles into the muscles. Most patients, however, tolerate the procedure just fine. Sometimes intraoperative nerve action potential recordings (NAPs), which measure the function of nerves during surgery, are necessary to establish whether a nerve must undergo repair or if it can heal on its own. Imaging studies can be quite helpful in patients with peripheral nerve problems. For example, patients who have peripheral nerve tumors almost invariably require an MRI. This study uses harmless magnets (NOT ionizing radiation) to create highly detailed pictures of the relevant anatomy, including the tumor. Such detailed pictures facilitate the planning of surgery to treat peripheral nerve tumors. CT myelography is used to evaluate brachial plexus traumatic injuries. The brachial plexus represents the network of neural structures that connects the nerve roots exiting the spinal cord in the neck to the individual nerves in the shoulder and arm. Patients who have suffered severe brachial plexus trauma may actually have one or more avulsion injuries, in which the nerve roots are actually pulled out from the spinal cord in the neck. A CT myelogram is really the only way to reliably document this type of injury. To perform a CT myelogram, contrast dye is injected along into the spinal canal. 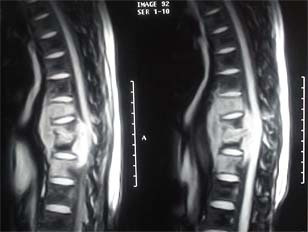 Then spinal X-rays and a spine CT are performed. Our office staff will work with you to find the most mutually convenient time to schedule your surgery. This may be done either when you are in the office or perhaps over the phone. You will need to have preoperative medical clearance. This is a process whereby your personal physician (generally an internist, cardiologist, or other primary care physician) checks some blood and urine tests, an electrocardiogram, and a chest x-ray to see whether you have any medical conditions that might cause problems during or after your operation. For example, your blood pressure should be well-controlled, as should your blood sugar. Some patients may require additional testing before medical clearance is granted. For example, those with a history of heart disease may require a echocardiogram or a stress test in addition to the standard electrocardiogram. In general, patients are asked to hold on to their own imaging studies after each office visit. That way, the physician’s office cannot ever lose your films. It is important, however, to bring the necessary films to surgery. Some imaging studies are so crucial that the surgery cannot be performed without them. Generally, your physician will let you know if that is the case ahead of time. The evening before your surgery, the hospital will notify you of your time of surgery, and what time you should arrive at the hospital. Other general instructions will include having nothing to eat after midnight the evening before surgery. Notify your physician if you do not receive instructions by 8 or 9 PM the evening prior to your surgery. It is normal to be a bit nervous prior to your surgery. Perhaps the best thing to remember is that you are under the care of an enormous family of health care workers, from physicians, to nurses, to therapists, to staff members, all of whom strive to make your stay with us as pleasant as possible.